We’d love your help. Let us know what’s wrong with this preview of No Less Days by Amanda G. Stevens. How many lifetimes can God expect one man to live? Over a century old, David Galloway isolates himself from the mortal humans who die or desert him by making a quiet life as a used bookstore owner in Northern Michigan. But then he spots a news article about a man who, like him, should be dead. Daredevil celebrity Zachary Wilson walked away unsca David Galloway can’t die. Daredevil celebrity Zachary Wilson walked away unscathed from what should have been a deadly fall. David tracks the man down, needing answers. Soon David discovers a close-knit group of individuals as old as he is who offer the sort of kinship and community he hasn’t experienced for decades—but at what cost? David finds himself keeping secrets other than his own. . .protecting more than himself alone. He’ll have to decide what’s worth the most to him—security or community. When crimes come to light that are older than any mortal, he fears the pressure is more than he can stand. What does God require of him, and is David strong enough to see it through? To ask other readers questions about No Less Days, please sign up. An amazingly good read. It fit me as few other books have. Will there be more to build on the story? Well, to be perfectly honest, I must say that I wasn't even considering reading this until I saw the cover. Speculative isn't my thing, and I wasn't going to risk reading a book I was pretty sure I wouldn't like. But then it popped up on NetGalley, and I grabbed it on impulse. In the very first chapter, I was hooked. I had too much to do to read it in one sitting, but I did read it in under 24 hours. The writing style is so thoughtful and flows so well, with a cadence that has a trifle of nostalg Well, to be perfectly honest, I must say that I wasn't even considering reading this until I saw the cover. Speculative isn't my thing, and I wasn't going to risk reading a book I was pretty sure I wouldn't like. But then it popped up on NetGalley, and I grabbed it on impulse. In the very first chapter, I was hooked. I had too much to do to read it in one sitting, but I did read it in under 24 hours. The writing style is so thoughtful and flows so well, with a cadence that has a trifle of nostalgia to it and fits perfectly with the character's voice. I loved all the old literary references and especially the musical references to Stephen Foster's compositions. The handful of people David meets have had plenty of hard knocks in life—more than the average share, obviously. I love how Amanda Stevens dove straight into the hard topics and shared a strong Gospel message along the way. It deals with faith, justice (whew! On some scenes...), reliance on God despite our circumstances, and so on. I loved, also, how human David is and yet still a manly, principled hero. Now can I have a sequel, please? Content: some "acceptable" crudities which I didn't care for reading; most people won't mind. Also some references to people having slept together outside of marriage. Meet David Galloway. Lived a century and a half, hasn't aged past thirty-five. Lover of books, soldier and defender. Man of God, man who makes mistakes. Solitary soul by choice, nevertheless desperately lonely. About to discover a community he never knew existed, but there will be a cost. Here's hoping you will grow to love this young/old man. The plot of this book is bizarre, like a SyFy Channel telefilm. It works as a literary parable of sorts; parts of it weirded me out, though. Love the cover! And what’s not to love about a bookstore owner as the main character? I enjoyed aspects of the novel. I do not read much speculative fiction. My rating may be more a reflection of my reading taste than the novel itself. This book is unlike anything I have ever read before. Alluring and timeless, it is punctured with bittersweet nostalgia and a rumination on eternity as well as the ripples we cast into the fabric of the world. A hero that captures from page one, a universe that never once breaks its own rules, a fantastical look at questions of faith and time and the vastness of eternity. There are deeper theological tenets than may initially be seen as a reader falls into the engaging and accessible prose. It is This book is unlike anything I have ever read before. Alluring and timeless, it is punctured with bittersweet nostalgia and a rumination on eternity as well as the ripples we cast into the fabric of the world. A hero that captures from page one, a universe that never once breaks its own rules, a fantastical look at questions of faith and time and the vastness of eternity. There are deeper theological tenets than may initially be seen as a reader falls into the engaging and accessible prose. It is so readable; but stop and savour and be dealt a whopping serving of questions about belief --- in others, in God, in how we influence. I have to begin by saying that speculative fiction is not one of my favorite genres, but Amanda Steven's writing pulls me in every single time. The premise for this particular book is immortality. David, the main character, is a longevite or immortal. He was 165 years old but his aging process had stopped at 35. Steven's writing style, word choice, and sentence flow carried the story from chapter to chapter and kept drawing me deeper into the story. I loved the setting of David's bookshop and ho I have to begin by saying that speculative fiction is not one of my favorite genres, but Amanda Steven's writing pulls me in every single time. The premise for this particular book is immortality. David, the main character, is a longevite or immortal. He was 165 years old but his aging process had stopped at 35. Steven's writing style, word choice, and sentence flow carried the story from chapter to chapter and kept drawing me deeper into the story. I loved the setting of David's bookshop and how she drew in the books in the store into the storyline. Can't imagine any booklover not enjoying this. One of my favorite scenes was towards the end when David was playing the piano and drew Tiana into duets with him and they played many older songs through the different time periods which David had lived. The plot is intriguing with plenty of action as David connects with 4 other (unknown to him) longevites. The character development is excellent as each of the major and minor characters is quite unique and has their own strengths and weaknesses. David has led a lonely and closed off life for many years with only his turtle for companionship and his bookstore clerk, Tiana, for a superficial friendship, It was wonderful to see him grow and open himself up to other relationships as the story developed. I also loved the communal feeling that grew between the longevites, David and Tiana.The slowly developing relationship between David and Tiana was a sweet touch. Stevens never shies from Christian themes in her stories and focuses on morality, Christian fellowship, mortality, and salvation in this particular book as the characters face tough moral decisions and one character deals with an abusive relationship. In one extremely dark episode, the characters are faced with a moral decision which really has no good options. Definitely recommend this book and am hoping that the threads left hanging will be picked up in a future book. I would love to see a series develop from this initial longevite story. **Thanks to Amanda Stevens and Shiloh Run Press for an ARC. Opinions are mine alone. I was not compensated for this review. It’s been a while since I’ve read a Christian Fiction. Young Adult continues to become staler, so I welcomed the change in genre. My desire to like this book ended up outweighing how much I actually liked it. While the writing style, premise, and character development were great, I felt that the plot tended to be disjointed and without direction. Rather, the plot happened, and the characters had to catch up to it. Instead of the characters actively moving forward, events kept happening to prevent them from doing so. These were drastic events, that often took me by surprise---but not necessarily in a good way. Set in a small town in Northern Michigan, the plot also moves around to the Grand Canyon in Arizona, and a few other places along the way. In general, there isn’t much world building to speak of, because the setting already exists in real life. The characters’ lives are the center focus and don’t rely much on the location or world-building to function as such. As stated before, I thoroughly enjoyed the first quarter of this book immensely. It hooked me in, and wouldn’t let me go even when the going became rough. That’s probably the most disappointing thing with a book that has such a fantastic start and a mediocre climax---I’ll read through the back cover, looking for more to happen, because the given ending doesn’t suffice. With saying that, the pacing remained rather consistent throughout, except for a few areas where it was caught up in some certain events for too long. The further on the plot moves, the less “readable” it becomes. The content discussed nothing close to light-hearted, as major topics related to dealing out justice are visited in very real, and very unsettling ways. The point-of-view follows the main character, David Galloway. A thirty-five-year-old by appearance, David has lived many more years than that. Because of his unique experience with life, David’s character is more complex than most. His longevity has challenged him in every possible way, especially his faith. Immortality is a major factor that separates humans from God. What happens when that veil is torn away? David faces a dilemma far more tragic than most. He’s lived, loved, and mourned, as the ones he’s loved have come and gone---as they were meant to. David, stuck in an everlasting state of the present, tries to find meaning in his life. Still a God-fearing man, he deeply struggles with why God would allow him to live on, while everyone else around him fades away. David doesn’t necessarily blame God, but deeply questions the reasons behind his own existence and purpose. It isn’t until David comes across Zachary Wilson that he starts to learn more about his condition. Tiana, a coworker and female counterpart with David, serves as a definite mediator for him. She’s sassy and smart, but not overbearingly so. (view spoiler)[While I knew from the beginning it would happen, (hide spoiler)] the immediate attraction between David and Tiana isn’t intrusive. I appreciated that their relationship had time to develop, as well as being realistic and not over the top. The remaining characters Zac, Colm, Moira, and Simon, all serve a definite purpose in the plot. They each have their own personalities, and some play pivotal roles. I didn’t find myself as drawn to their stories, however, even when David discovered that Zac had survived an eight-thousand-foot drop into the Grand Canyon. I found myself caring mostly about David and wanting to see what would happen to him directly. This may be an obvious theme, seeing how David cannot die. However, I can’t say that I’ve ever deeply considered the implications immortality would hold for a Christian. Considering how our faith points us towards the future---the moment when we are reunited with God in heaven is what we aim for. What do we do when that is taken away? The entire point of believing that Jesus Christ died for our sins is to enter heaven to be with him and escape the evil that sin brought upon the earth. Initially, humans were created to dwell with God on earth. But when sin was introduced, and everything tainted, it made that coexistence impossible. It truly is a relief knowing that this life is short-lived when compared to eternity. It is also a relief that we must deal with sin for a short period of time because it truly is a terrible thing. What does one do when that reprieve is taken away? An interesting theme that I didn’t think about before heading into this topic was how many way immortality would affect a person. Perhaps it's obvious to most---for myself, I honed in on the promise that immortality would take away from a believer. I didn’t think about not being able to make connections with others, simply because they’d think you crazy, cursed, or even evil. David’s story includes a strong message about how isolation from the church and Christian community can literally devastate a person. We are created as social creatures---isolation is the opposite of the human intention. Personally, I find it easy to think about how meaningless life would be if I simply existed. The fact that David remained a Christian after all of his time on earth (was fantastic) showed how steadfast his character is. In this scenario, he’s compared and deeply contrasted to Colm, who took a very different approach to immortal life. Having the gift of immortality can ruin a person in many ways. Both David and Colm experienced this in similar and also very different ways by the choices they made. This portion may include some spoilers! This is by far the hardest and most sensitive themes presented in No Less Days. What does one do with a person who is a killer, and happens to be immortal? Stevens did not spare the reader from facing harsh scenarios. I can’t say that I’m happy with what the conclusion that this question led to, however, I can see how it’s justifiable. If a person thinks themselves a “god” of some sort due to their immortality, and above “mortals,” what would motivate them to stop ritual killings? Not only that, what do you do with a person who can live forever and is a murderer? This topic really made me search myself. I’d like to think that I’d be more gracious, and allow the person another chance. But when the guilty openly admits that he won’t stop what he’s doing…then what? Colm clearly has some deep-seeded issues. Allowing his “gift” to manifest into something twisted, it really pushes the reader to consider how one would handle a situation such as this. His desperation shows just how corrupt he’s become by his station. When everyone discovers the secrets he’s been hiding for years, it becomes a situation that simply cannot be ignored and cast aside. Addressing his crimes head-on is by far the most difficult element in this plot. ⇒ I can’t say that I’ve encountered Speculative Fiction often. However, this book has convinced me that it’s a genre I should be looking out more for. ⇒ Several of the major themes discussed in this book, and the creative way they were pulled into the plot. ⇒ The way Colm’s situation is handled. Is someone truly deserving of his fate according to Biblical teachings? Would have grace and mercy been sufficient and turned him around? I feel as though it should have been explored and entertained much more. ⇒ Events in the plot felt random and sometimes forced. ⇒ Certain events were drawn out too long and pulled the reader's focus away from the entire picture being portrayed. Overall, I really enjoyed this read. However, I felt that some of the content was drawn out and not always addressed in the correct way. Also, while the story is clearly plot-driven, it felt forced at times and events just happened to keep the reader engaged. I would have liked to learn more about David, his past experiences/lives, and so much more! I think that this is a solid piece of work but needed more character focus in order to be great. Violence: Unrelated stabbing and shooting scenes, along with some details of fatal injuries. Have you ever met a character you desperately wanted to hug? Not in a book-boyfriend kind of way, but in an ‘I see your burdens and I want to help you carry them’ kind of way? David Galloway is that character. He might look like he’s only thirty-five, but he’s been alive for more than 150 years. And those years weigh on his soul. We often think of immortality as something to be prized. David Galloway will challenge you to rethink that idea in a profound way. I’ve actually read this book twice now Have you ever met a character you desperately wanted to hug? Not in a book-boyfriend kind of way, but in an ‘I see your burdens and I want to help you carry them’ kind of way? David Galloway is that character. He might look like he’s only thirty-five, but he’s been alive for more than 150 years. And those years weigh on his soul. We often think of immortality as something to be prized. David Galloway will challenge you to rethink that idea in a profound way. I’ve actually read this book twice now, because the first time I read it, it rendered me speechless. The characters reeled me in quietly, chapter by chapter, and then—BAM!—took me in a direction that was totally unexpected and one of the most gripping dilemmas I’ve ever come across. I couldn’t put the book down until I was finished, and even then I’m pretty sure I just sat there like a deer in headlights, unable to remove myself from the world of the story or even form a coherent thought. I simply felt. Second time around, I loved this story even more. There is so much depth to it, and Amanda G. Stevens has an exquisitely understated touch when it comes to conveying the soul of her characters. David’s is a beautiful, if burdened soul—hence the impulse to reach out and hug him through my Kindle! And if his soul is burdened, then I suspect tortured is the best description for the souls of his fellow longevites, Zac and Moira. I’m waiting with bated breath for their stories to unfold. This is a stunning and thought-provoking story of life and death, the gift of love, the burden of sin, and the rest we can find in Christ. Enigmatic and imaginative, No Less Days holds readers hostage to a beautifully written story that boldly touches on the real--and hard--things of this life. Amanda delivers truth and creativity in equal measure, balancing the speculative with the contemporary in a way that will keep you turning pages until the end. Thank you to the author and Barbour for letting me read an advanced copy of this! My thoughts are entirely my own. Honestly, though I was intrigued by this back blurb, No Less Days languished on my TBR pile until just before it was due back at the library. Probably because I didn't know exactly what to expect. I'm such a cautious reader sometimes! And guess what? I was hooked by page two and settled into a serious reading fest since the book was due the next day! Bwahahaha!! I'm such a doofus! The whole immortality concept fascinates me -- especially the unexpected burdens associated with living and loving am Honestly, though I was intrigued by this back blurb, No Less Days languished on my TBR pile until just before it was due back at the library. Probably because I didn't know exactly what to expect. I'm such a cautious reader sometimes! And guess what? I was hooked by page two and settled into a serious reading fest since the book was due the next day! Bwahahaha!! I'm such a doofus! The whole immortality concept fascinates me -- especially the unexpected burdens associated with living and loving among people who age and eventually die. Out of necessity, David attempts to keep himself apart from the rest of the world. A loner, hiding out in a used book shop (I so adore books about books! ), he deliberately keeps himself aloof until his carefully contained world implodes. But the thing that surprised me the most about this book is the amazing inspirational thread woven throughout. You don't usually get that in speculative fiction so it kinda blindsided me (in a good way.) David's faith is very 'old world', while his friend, Tiana, is an enthusiastic 21st century Christian and surprisingly, there's a lot he can learn from her. David : Is a thirty-five year old man searching for the reason God created him different from other human beings. Hiding from a past that haunts him and a burden he doesn't understand, David comes face to face with people who know him. Others just like him who know what's happening..... people who can help. But when a secret is unburied David realizes God may have directed these people to him for just this purpose. I’m not entirely sure what I expected this story to be about…but it surprised me. Wonderful points: The story in no way drags, and the conflict/struggles of the characters kept building, keeping me turning the pages. I’m a fan of this author. (Read her other series) And what I like best about thi I liked David—a lot. I’m looking forward to book two where I think the supporting characters will really start to shine….some I have a feeling we won’t want to shine 😉 But that’s all I’ll say to not provide spoilers. And plus, that’s just my prediction. This is a BookishFirst book. I have mixed feelings about this one. I struggled a lot in the beginning to get interested. I kept reading hoping for something to happen because when I read the synopsis it sound like it would be a great book. I was disappointed. Nothing happened until David found more of his kind and even then it only became slightly more interesting for me. The only reason I have this one 3 stars instead of 2 is because of the exceptionally well developed characters. I think the au This is a BookishFirst book. I have mixed feelings about this one. I struggled a lot in the beginning to get interested. I kept reading hoping for something to happen because when I read the synopsis it sound like it would be a great book. I was disappointed. Nothing happened until David found more of his kind and even then it only became slightly more interesting for me. The only reason I have this one 3 stars instead of 2 is because of the exceptionally well developed characters. I think the author tried to do to much in this story, take it in to many directions, it makes the story seem...cluttered, jumbled. No Less Days is difficult to define by genre. The publisher lists it as Suspense, and it is that; the author's bio states that she writes Speculative Fiction, and it is that too, though it is also Contemporary (small town) Fantasy. But at the heart it is the story of a man who feels alone but for his faith in God, a man who finally learns that he is not the only one of his kind after a century of living and losing those he loves. It is that discovery, and a new openness to relationship, that enge No Less Days is difficult to define by genre. The publisher lists it as Suspense, and it is that; the author's bio states that she writes Speculative Fiction, and it is that too, though it is also Contemporary (small town) Fantasy. But at the heart it is the story of a man who feels alone but for his faith in God, a man who finally learns that he is not the only one of his kind after a century of living and losing those he loves. It is that discovery, and a new openness to relationship, that engenders reader sympathy for David Galloway even more than his love of books, his attempted denial of his attraction to his employee Tiana, and his sensitive handling of another employee's difficulties. So, as he discovers the existence of more of his kind and becomes embroiled in the situation that lends this story the element of suspense, an air of impending peril, and a great deal of tension, the reader is swept along and does not always know what to expect. This is a novel that leaves the reader wanting to quietly, with calm sincerity, suggest that though it might not be your usual cup of tea, give this one a read. It is good. This review refers to an e-galley read through NetGalley, courtesy of the publisher. A positive review was not required and all opinions expressed are my own. I had something of an up and down relationship with this book. I was so drawn in by the title and the first line of the blurb, I didn't read past that before diving into the novel. I found the first quarter of it or so to be intriguing as all get out. Yet, most of the read was slow for me, and I didn't get a sense of a focused, driving point or purpose in the plot. It was almost as if stuff was just...happening, and I couldn't tell how much a particular subplot was even necessary. The novel stops I had something of an up and down relationship with this book. I was so drawn in by the title and the first line of the blurb, I didn't read past that before diving into the novel. I found the first quarter of it or so to be intriguing as all get out. Yet, most of the read was slow for me, and I didn't get a sense of a focused, driving point or purpose in the plot. It was almost as if stuff was just...happening, and I couldn't tell how much a particular subplot was even necessary. The novel stops with loose ends, so I trust there's a sequel coming, but I do wish the conclusion could've brought more cohesion to the whole. It's not often I'm this unsure about exactly what I'm taking away from a story. Still, this author demonstrates a knack for not overstating or spoon-feeding everything to the reader, which I can appreciate. Oh--and how the cover grew on me! The "Old & Rare Books" bookstore and the lighting that's equally soft and bright in the pouring rain at night is pretty perfect. I read a lot and so I’m always looking for books that are unique and out of the box. This book ticks both those boxes in a thought provoking way. I loved the characters, especially David, and the depth of their emotions and struggles. I loved the range of diversity in this book which was handled on so many levels. This is a story that will stick with the you. One you’ll be pondering long after 5e last page. My rating is 5 out of 5 stars. Amanda has written a unique story that begs the question, “Would anyone want to live forever”? Her main character, David Galloway, has lived many lifetimes with many memories both good and bad. He wonders if he is the only one to have done so. David is a former soldier and thinks like one, but his faith is deep including the seasons of wrestling with God. David owns a bookstore that carries antiques, first prints and a whole range of genres, but nothing compares to his personal library at home. The problem is no one is close enough to David, by his choice, for them to really know him and he thinks he prefers it that way. Yet, one story is about to turn his whole world upside down and challenge his faith, worldviews and the wall around his heart. When my husband saw the book, he thought it was sci-fi, but it really isn’t. I found the story inside very well written, engaging and thought-provoking. Some of the experiences David has reflect modern day life choices. For instance, when David is the one who has been hurt by loss many times and rejected too will he ever be willing to let another person really know his heart? Will he risk the disappointment by walking in a building to fellowship with people who might let him down even though they try their best not or will he let them down? This is a fascinating tale that grabbed my attention and kept it until the last page. The book has mystery to it along with romance, hard choices for a man of faith, and so much more. I hope you read the book and enjoy it as much as I did. I wonder too if the author plans on writing more stories that include some of the other aspects and characters she introduced here; I guess only time will tell! No Less Days is Forever with a dash of Highlander. It’s part science fiction and part urban fantasy. David Galloway is 167 years old, but looks thirty-five, thanks to a doctor who saved his life over 130 years ago. He’s survived five major wars, and now makes a living selling second-hand and antique books. He thinks he’s the only one of his kind until he sees a news story about a daredevil who falls to his death crossing the Grand Canyon, yet miraculously survives. David is curious. There is no w No Less Days is Forever with a dash of Highlander. It’s part science fiction and part urban fantasy. David Galloway is 167 years old, but looks thirty-five, thanks to a doctor who saved his life over 130 years ago. He’s survived five major wars, and now makes a living selling second-hand and antique books. He thinks he’s the only one of his kind until he sees a news story about a daredevil who falls to his death crossing the Grand Canyon, yet miraculously survives. David is curious. There is no way this daredevil, Zachary Wilson, could have survived that fall. Is there someone else like David? He goes to Nevada to find out the truth, and finds something unexpected: he is not alone. 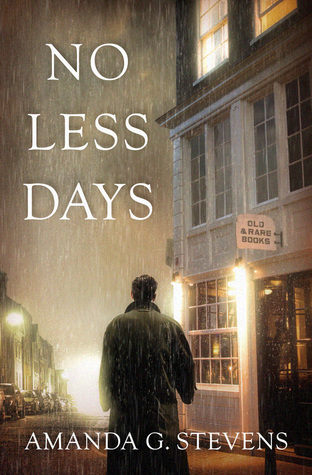 No Less Days isn’t the usual book I review. But if there were more Christian novels like this, I’d read and review them because No Less Days was excellent. A unique hook: the man who lives forever. Great characters: David, Zac, Tiana. A moral dilemma to work through. And lots of amusing insights from a man who has lived longer than he should. The story of No Less Days is told entirely from David’s viewpoint, and that’s one of the strengths. Learning things about the Longevites as David learns them gives the sense of being in the story. The writing is excellent, and while this story comes to a complete and satisfying end, there is certainly scope to turn No Less Days into a series. Won E-Book ARC from BookishFirst.com. Nowhere does this book say it's Christian fiction. EDIT: Ok on the Amazon page it does but as I got an ARC, I didn't know it was. I don't mind reading Christian fiction but I do like to be warned beforehand. This is considered speculative fiction and that's all I've seen for genre. So I will warn other people outright. Going into this I liked it. I liked the concept a lot and thought it was pretty interesting. Then we got too religious for my taste but I'm ac Won E-Book ARC from BookishFirst.com. No Less Days is not my typical read. Yet now within six months, I’ve read it twice and parts of it more than that. Why? Why has this book with its unique premise captured my imagination and heart so? Quite possibly it has something to do with the setting—a quaint little bookstore in my very own beloved home state or the captivating writing, the intense emotions churning in the book, the gentle and beautiful romance, the believable oldness and history of the main characters, or the themes of fait No Less Days is not my typical read. Yet now within six months, I’ve read it twice and parts of it more than that. Why? Why has this book with its unique premise captured my imagination and heart so? Quite possibly it has something to do with the setting—a quaint little bookstore in my very own beloved home state or the captivating writing, the intense emotions churning in the book, the gentle and beautiful romance, the believable oldness and history of the main characters, or the themes of faith and surrender to God. I don’t know what it is, but I think that all of these elements blend to make an epic tale that appeals to readers despite themselves. Because of some mature themes, I’d have to recommend this novel to older teens and up—please feel free to private message me for details if you’d like—but as to the overall tone of the book, I finished reading feeling uplifted and inspired. No Less Days was a book that was so out of the box for an inspirational read and I enjoyed it immensely. I do not know if I would call it a paranormal story or not but whatever category it fits in, it was an exciting and a very different read. One of my favorite shows on TV was a drama called Forever (which sadly only lasted one season, but that season is worth a watch), and it dealt with a man who could not die. He was a few hundred years old and life continued on with him whether he liked it o No Less Days was a book that was so out of the box for an inspirational read and I enjoyed it immensely. I do not know if I would call it a paranormal story or not but whatever category it fits in, it was an exciting and a very different read. Due to a so called miracle to happen to a celebrity by the name of Zac Wilson, David goes in search of answers and finds much to his astonishment he gets his questions answered. Not only that but he is not the only one. This was quite a tale and the author does a great job on making the whole situation seem realistic. She explains what happened and it is really something. I like how they are not just super heroes, or immortals, but they are very human with hurts, loves, but they have not been able to die. I cannot imagine what kind of existence that would be like especially when everyone you know and love will eventually die and the world constantly changes. David Galloway was a drummer in the Civil War and now in 2018 looks 35 years old. He was treated with a special serum developed from a species found in a pond near his home when he was motally injured by a doctor who was experimenting with a new cure. He has always thought he was the only one, but when a stuntman survives a fatal fall, he is off to see if there are more people like him. In the meantime, he is fighting the attraction he feels for the woman who works in his store because he can't David Galloway was a drummer in the Civil War and now in 2018 looks 35 years old. He was treated with a special serum developed from a species found in a pond near his home when he was motally injured by a doctor who was experimenting with a new cure. He has always thought he was the only one, but when a stuntman survives a fatal fall, he is off to see if there are more people like him. In the meantime, he is fighting the attraction he feels for the woman who works in his store because he can't bear the thought of loving yet another woman who will grow old and die while he lives on. This book had a lot of potential, but I really didn't enjoy it. It was confusing, and I didn't like the unrealistic aspect of it. I did like how the main character owned a bookshop, and how many of the books were older books. This books wasn't my cup of tea, but I think there's definitely an audience out there for it. 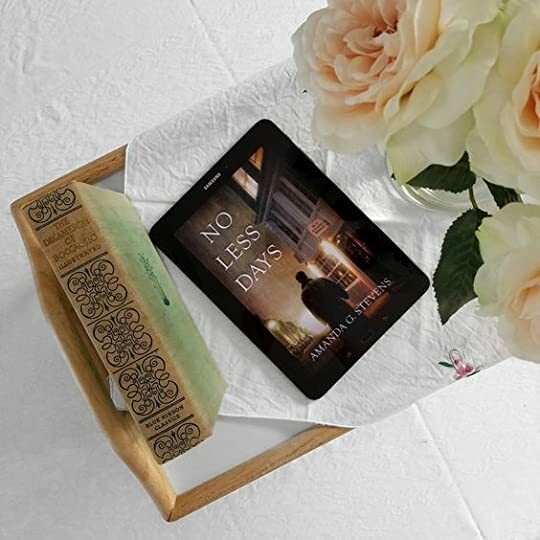 No Less Days, written by Amanda G. Stevens is a story of 5 people who were treated with a specific drug following an injury or illness, to save their lives. Each are now over a hundred years old and cannot die. David feels he is all alone. When he reads about a stunt man, Zachary Wilson, who fell to what should have been his death but lived, he goes to talk to him. This is when he meets others like himself and finds out how this all came about. He has had to keep his secret all these years and i No Less Days, written by Amanda G. Stevens is a story of 5 people who were treated with a specific drug following an injury or illness, to save their lives. Each are now over a hundred years old and cannot die. David feels he is all alone. When he reads about a stunt man, Zachary Wilson, who fell to what should have been his death but lived, he goes to talk to him. This is when he meets others like himself and finds out how this all came about. He has had to keep his secret all these years and is now finding he wants to share it with his employee and friend Tiana. This is a great book to read. It is full of suspense, with just a touch of romance, and kept me wondering what was going to happen next. The story also made me wonder, if someday a discovery was made to not age, would we really want to use it. What would it be like to never be able to get close to those around you, to lose so many friends and family member as well as to see so many wars and tragic events? This is a great story and I would recommend it to those who enjoy speculative fiction. This book also contains some good discussion questions that would make it a good book for reading groups. David Galloway is a character you can’t help but sympathize. Years (decades and centuries) of living a solitary life while closely guarding his secret haven’t deterred him from living as a man of integrity. A man who is willing to do the right thing, to seek justice, no matter the difficulty. Even when David finds others like him, he continues to stand on the fringes, often alone in the crowd. I read Amanda G. Steven’s Haven Seekers series and enjoyed it, but this book has so much more depth to it David Galloway is a character you can’t help but sympathize. Years (decades and centuries) of living a solitary life while closely guarding his secret haven’t deterred him from living as a man of integrity. A man who is willing to do the right thing, to seek justice, no matter the difficulty. I read Amanda G. Steven’s Haven Seekers series and enjoyed it, but this book has so much more depth to it. Each of the characters is well developed and interesting. With a hint of nostalgia for the way things once were with references to classic books and movies, and the possibility of something David has given up on edging in. No Less Days is a story that is unique and timeless, one that explores many spiritual topics such as right vs. wrong; listening for (and obeying) God’s voice; and relationship and community without preaching to the reader. I enjoy finding a new author that I haven’t read before. Especially when this new author has older books that I may have to discover as well. This new novel by Amanda Stevens is one such new to me author and I think you’ll enjoy her as well. This book, in my opinion, read like a movie. The kind where it’s a little slow to get into until you’ve been introduced to all of the characters and learn their backstories and how they figure into the story. The plot/story was intriguing and caused me to pau I enjoy finding a new author that I haven’t read before. Especially when this new author has older books that I may have to discover as well. This new novel by Amanda Stevens is one such new to me author and I think you’ll enjoy her as well. This book, in my opinion, read like a movie. The kind where it’s a little slow to get into until you’ve been introduced to all of the characters and learn their backstories and how they figure into the story. The plot/story was intriguing and caused me to pause as I read the synopsis. Never dying? I wasn’t sure where that fit into my religious belief, but that’s the great thing about Fiction, it’s all made up  Anyway, I think the pace of the story works, I think the characters were believable and I think this book is one that you need to pick up and read. Is this a "guy's book"? Yes and yes. This book is terrific and this is one topic that will allow us years of debate. Disclosure of Material Connection: I received a complimentary copy of this book from Barbour Publishing and I was under no obligation to post a review. I was excited to read No Less Days when I received it because I heard a lot of good things about it. The characters were strong and the plot was strong. I did have trouble staying interested. To me the book was extremely slow. At times it seemed that the book was going to pick up but it slowed back down. If you can hold on until around the middle of the book it gets better. I just don't care to read half a book before the stories gets really interesting. enjoyed Amanda G. Stevens Haven Seekers series. With each consecutive edition to the series, I was more involved with each individual character and I couldn't wait to see where the series ended. Stevens grabbed my attention with the concept and delivered what she promised. So of course, when I heard she was writing a new novel No Less Days, I really couldn't wait to get my hand on a copy. Boy, am I glad that I did. Stevens does a good job at creating stories of what if? What if Christianity had enjoyed Amanda G. Stevens Haven Seekers series. With each consecutive edition to the series, I was more involved with each individual character and I couldn't wait to see where the series ended. Stevens grabbed my attention with the concept and delivered what she promised. So of course, when I heard she was writing a new novel No Less Days, I really couldn't wait to get my hand on a copy. Boy, am I glad that I did. Stevens does a good job at creating stories of what if? What if Christianity had a bigger impact on the global scale? What if you couldn't die? She took No Less Days in a way I didn't see coming, but I throughly enjoyed it. She isn't afraid to talk about the dark issues in Christianity and throw it into a literal story. Her writing is excellent. I loved following David around in this story and watching him interact with his changing world. The plot was definitely something I haven't read anywhere, and I do read ALOT, so this was a refreshing tale to enjoy. I got caught up in the story from the beginning, and I really didn't want to put the story down. I finished it one day. What a great ride! The plot is filled with twists and turns I didn't see coming. Stevens had me turning the pages quickly to wonder what was going to happen next. I don't know if there is going to be more to the story as in a series, but I hope Stevens has more to this series up her sleeve because I would jump in line to read the rest of the stories. Overall, No Less Days by Amanda G. Stevens is an unique story with fascinating characters filled with many unexpected turns. I recommend this novel to fans of James Rubart. Both authors touch on spiritual concepts in the normal world. No Less Days by Amanda G Stevens is my first. I thought the book was well written and had me captivated from the start. I can't even begin to imagine living forever. The author does a brilliant job of showing us her vision. This is a well written story and I highly recommend it. As a child Amanda G. Stevens disparaged Mary Poppins and Stuart Little because they could never happen. Now she writes speculative fiction. She is the author of the Haven Seekers series, and her debut Seek and Hide was a 2015 INSPY Award finalist. She lives in Michigan and loves trade paperbacks, folk music, the Golden Era of Hollywood, and white cheddar popcorn.